Can be used to “spice up” any product. Seems to work well in conjunction with PI/W. The above dilution is approximately the same as PCC. Try stronger/weaker dilutions as well. An important issue is to ensure that there is no bad odor. Oil carriers (sweet almond oil, jojoba oil) and vanilla seem to work the best at covering the smell. If you find it too “sweet”, you can add a little citrus smell such as tangerine, or orange and lemon. Since PCCseems to be successful with a cucumber cover smell, Bath&Body Works Green Tea might be a cover for this dilution. 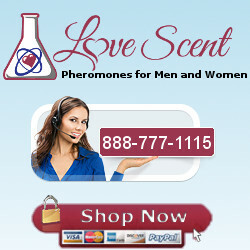 Many women have found that after 30 mins to an hour a good dilution of EW with a nice cover scent can become very pleasant.This is a copulins product and is intended to raise a man’s testosterone levels, which might make him agitated along with all of the positive connotations that come with this effect. Wearing it along with a friendly androstenol product might help to counteract this effect. In a night-club setting, no counteracting would be needed.